A Christmas market trader has been condemned for selling golliwog dolls depicting Sir Mo Farah – depicted performing the Olympic Gold medallist’s trademark ‘Mobot’ celebration. 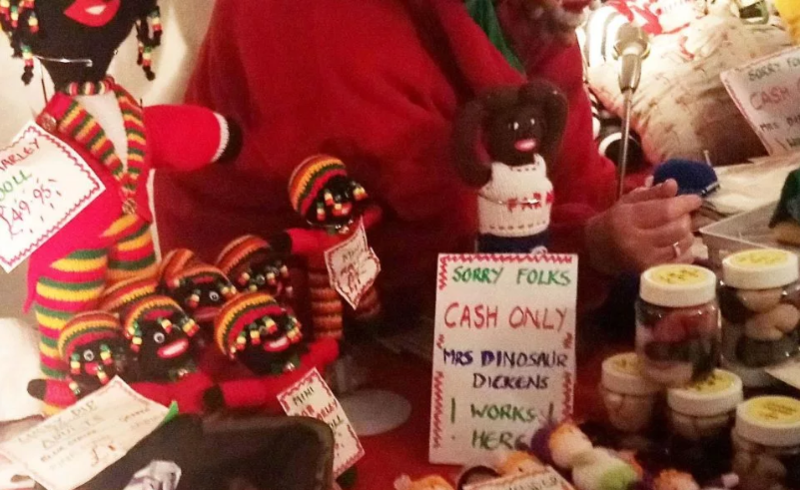 The doll – which features a white vest with ‘Farah’ printed across it – was one of many ‘completely inappropriate’ dolls being sold by one trader at Rochester Christmas Market in Kent, UK – including a giant Bob Marley golliwog doll, priced at £49.95. The council has now banned the sale of the doll after a local politician spotted them and complained on Twitter. Councillor Vince Maple, leader of the Labour Group, said: “Mo Farah is a national hero and an internationally respected athlete so to have somebody selling dolls of this nature is completely inappropriate at a council run Christmas event. Councillor Howard Doe, cabinet member for community services, said the sale of ‘Rasta dolls’ had previously been permitted, but the stall holder has been asked to withdraw the items. He said: “We do not allow gollys to be sold at the Rochester Christmas Market. “We permitted the sale of Rasta dolls within the City of Rochester Craft Fair, at the Rochester Christmas Market last year. “However, following reports that similar dolls were being sold at the market last weekend we have reviewed the situation again. “Although the dolls are not labelled as gollys we understand that they may unintentionally cause offence to some visitors. Gollys, or golliwogs, originated as fictional characters in children’s books in the late 19th century. During the 1970s, golliwogs were reproduced as rag dolls with black skin, frizzy hair and large lips. While the toys were once a normalised and popular part of culture, particularly in the UK, they are now considered to be racist representations of black people. Despite a broad change in attitudes and awareness, there are still those who seem oblivious or unconcerned by the offence the dolls can cause. As recently as September, a stallholder in Kent defended selling golliwog dolls, claiming that those who were upset ‘don’t understand’. In February, a landlord in Essex refused to remove golliwog dolls from the bar following a series of complaints.